Finally a night away (a minication) and our chosen destination is the Paramount House Hotel. 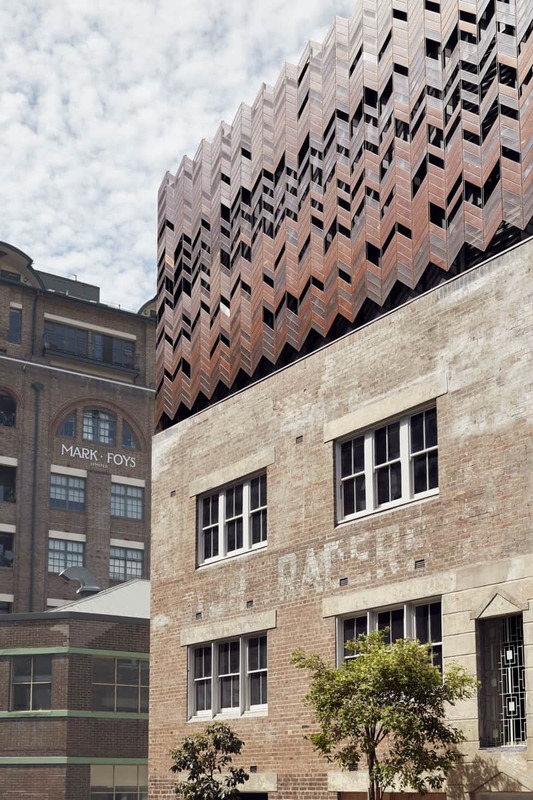 The hotel occupies the upper floors of the former Paramount Pictures Studios and adjacent film-storage warehouse in Commonwealth Street, Surry Hills. This hotel ticks all of the boxes for me and more. 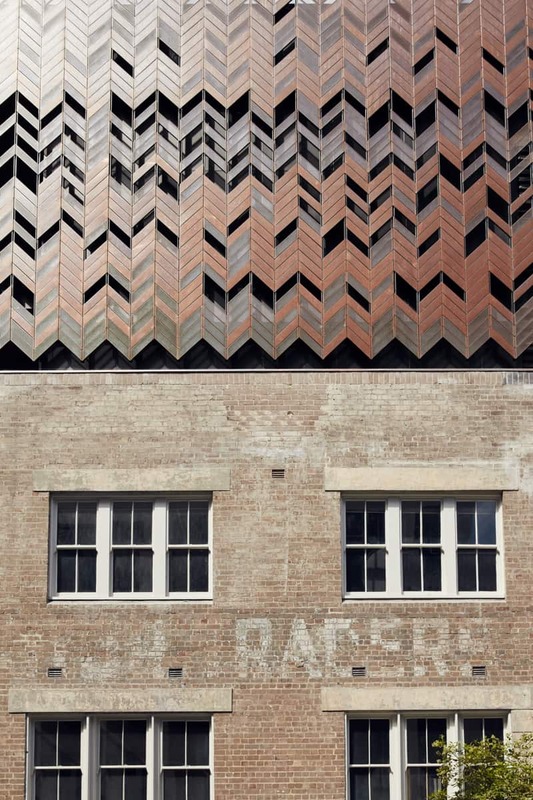 The heritage-listed building was restored over a four year period with the expansion of two extra levels and comprises two buildings connected behind the most magnificent copper clad facade. 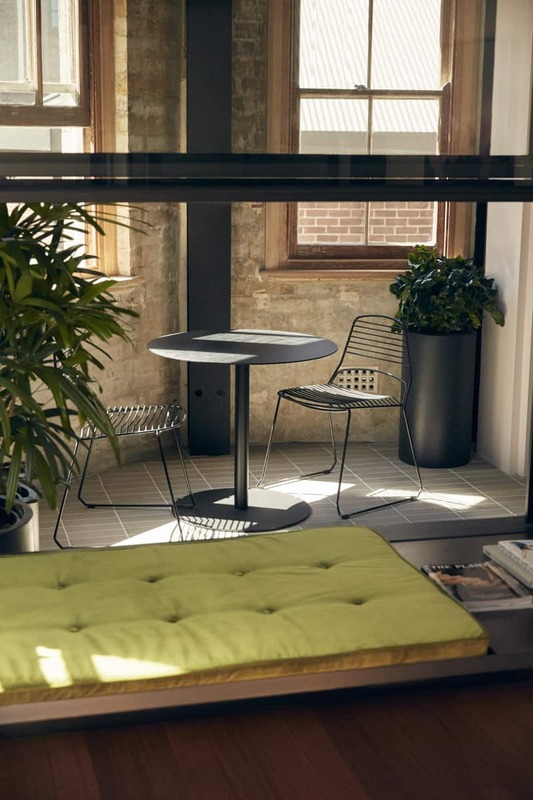 The original idea came from a talented collaboration of three friends and visionaries Ping Jin Ng, Mark Dundon and Russell Beard, and the build took place under the watchful eye and design of Melbourne firm ‘Breathe Architecture’. It was bound to be impressive regardless of this being their first hotel project. Being newcomers to the hotel trade has bought with it fresh new approaches. From the moment you enter the building you know you’ve found yourself a special destination. The atrium styled lobby is situated towards the rear where two buildings collide, the brickwork is raw, and the pipework exposed. The space is lit with natural light streaming through the sky-high skylights, and then there is the most amazing deco inspired copper screens, referencing the buildings 1940’s heritage. 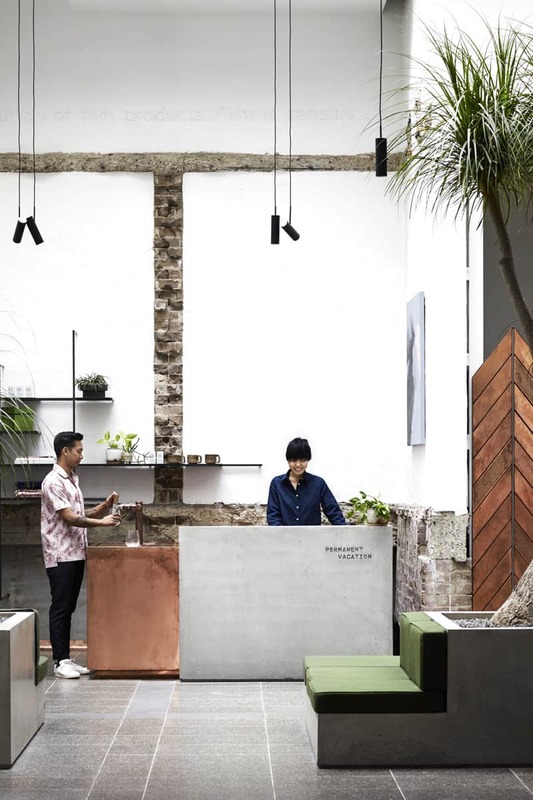 You are greeted by friendly staff who are more than happy to help and offer a selection of cool drinks (Cider, natural wine or kombucha) in stemless glasses whilst you wait for them to organise your room key. The room we stayed in had the most amazing attention to detail, as I’m sure they all do. 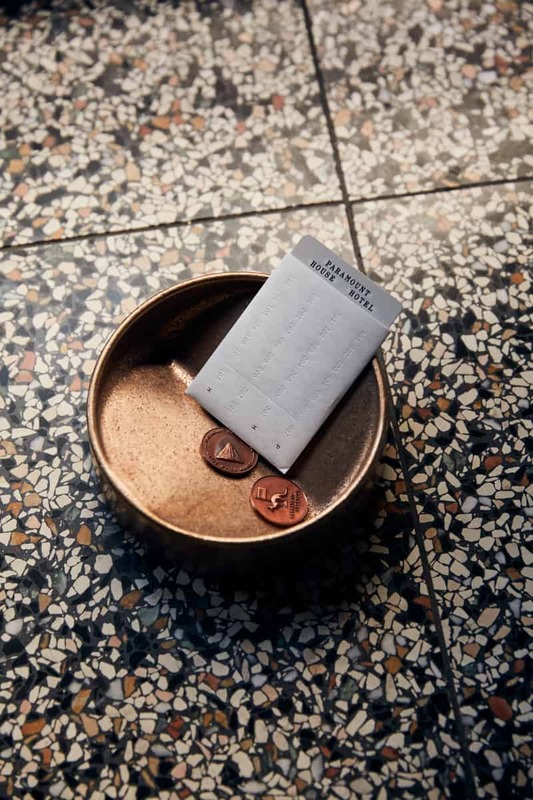 I was impressed to see a touch of Henry Wilson Design greeting me upon entering with the popular vide pouch (designed for your loose-pocket items… coins, keys, etc) sitting pretty on the entry bench. 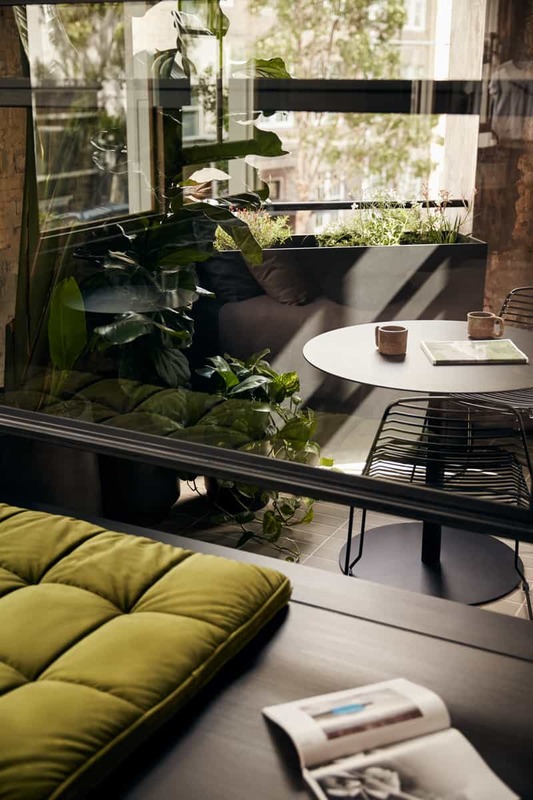 From opulent dark terrazzo bathrooms, brass taps, fittings and shower grates, stunning steel framed internal doors and windows with remote-controlled blockout blinds, and an enclosed private terrace with stunning lush indoor plants creating the perfect place of calm. 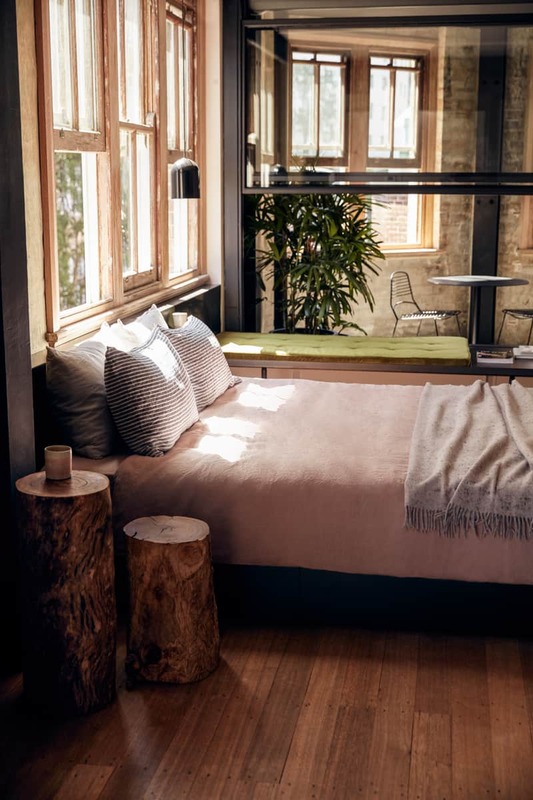 Oiled herringbone warehouse ceilings, stripped timber sash windows that you can open for fresh air flow (a rarity in city hotels) and the most luxurious European flax linen bedding by Cultiver. Cultiver bedding is our absolute favourite and the entire range is available through Monsoon Living. Every interior detail has been very carefully considered and the colour palette is sublime. 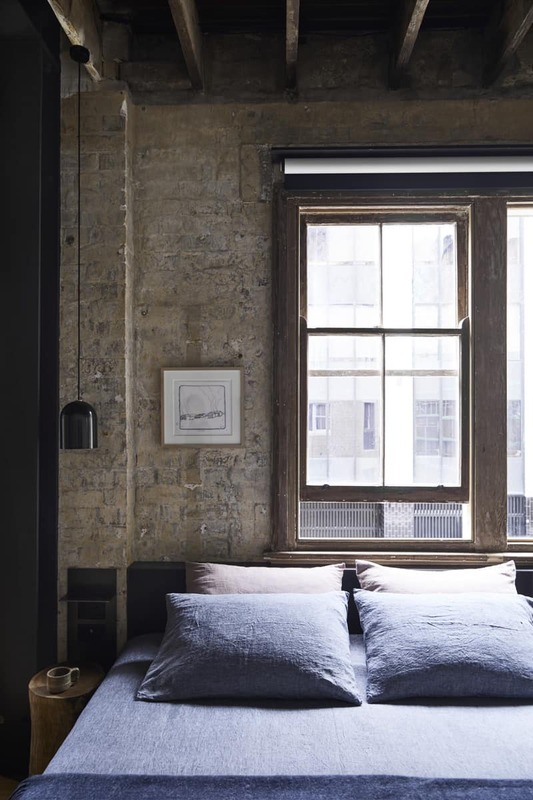 The architecture is a true expression of everything that is old and raw about a warehouse whilst balanced with the juxtaposition of something soft and tactile such as lush grass green carpet, plush Loom Rugs, soft wallhangings and original artwork curated by local gallery China Heights and then there is that beautiful linen bedding (wink, wink). 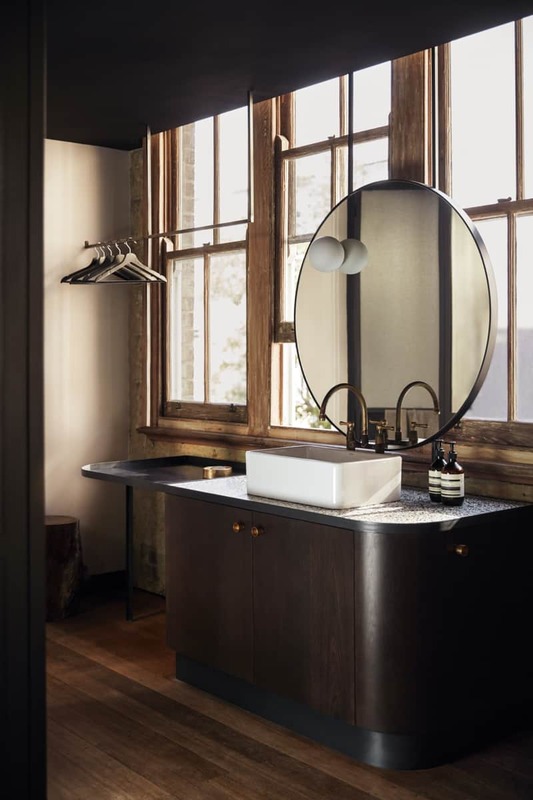 I loved our stay so much that we are already planning our next visit, but this time we may need to book one of the many rooms that feature a Japanese-style timber bath created by boutique carpenters Wood & Water. Honestly I could go on and on about the impeccable detail and fantastic location. I should mention Longrain and Chin Chin are literally across the street plus the Paramount Coffee Project is located at the hotels entry and the Golden Age Cinema and Bar is on the lower ground floor. The rooftop Paramount Recreation Club sounds amazing but I simply ran out of time, so look forward to exploring more on our next visit. If that is not enough to temp there is a new restaurant on the cards called Poly by the successful team at Ester coming soon to the Paramount. If you do visit the Paramount House Hotel I hope you enjoy your stay as much as we did and if you think sleeping in those linen sheets is heaven, you know who to call. The full range of Cultiver bed linen is available in store through Monsoon Living.